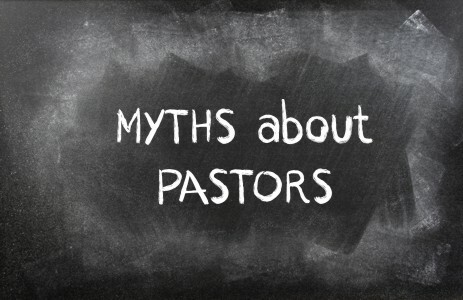 What Are Some Myths About Pastors? There are a lot of myths out there about a pastor and his family, so what are some of the myths some people believe? I was speaking with our deacon the other day about what he goes through in sermon preparation when I’m going to be gone, and he said that every week he struggles with what message God wants him to give. Just when he thinks he’ll give a sermon on one subject, he begins to doubt whether this is what God wants him to preach or not…so he studies some more and may even change his message for Sunday, but like me, he battles every week about what God wants him to speak on. My wife can tell you that I am in a battle every Saturday and Saturday night about the message God wants me to give. I fear that the message I bring is mine and not what God wants, so I try to remain sensitive to the leading of the Spirit. Sometimes God does convict me about a message and that the church needs something else rather than what I was preparing, so Saturday nights are one of the most miserable, toss and turning, sleepless nights of the week. I can identify with the Apostle Paul’s words to the church at Corinth, saying, “I was with you in weakness and in fear and much trembling” (1st Cor 2:3), because “my speech and my message were not in plausible words of wisdom, but in demonstration of the Spirit and of power” (1st Cor 2:4). Statistics from the Schaeffer Institute show that 70 percent of pastors regularly consider leaving the ministry, due to burnout, emotional health, or moral failure. In fact, 91 percent of polled pastors have experienced burnout, while eighty percent of pastors will not remain in the ministry for more than 10 years, and only 10 percent will enter retirement from a pastoral position . Maybe this is why the Apostle Paul says “We ask you, brothers, to respect those who labor among you and are over you in the Lord and admonish you” (1st Thess 5:12). Actually, money is not bad…it is the love of money that is at the root of all kinds of evil, but money of and by itself is not evil. It can create evil if pastors are only in the ministry for money, but that would be strange indeed since of the two lowest paid professions, pastor is one of them…teachers being the other. One man ridiculed me because he thought I was only doing this for the money, then I told him, “I’m a bi-vocational pastor that has to pay my own way, pay for my own expenses, and even my own health insurance is paid out of my own pocket,” but more and more pastors these days are “tent makers.” Church giving is down so much that many churches cannot pay their pastor a salary. This puts even more stress on the pastor because now he has to work a job (or more), pastor the church, take care of his family, and take care of things that no one else will do. I am the pastor at our church, but I am also the chief bottle washer, toilet scrubber, and trash man. We can’t afford a cleaning person so I do it myself. Pastors who have multiple undergraduate and graduate degrees could earn 2 to 5 times their ministry salary in the marketplace, so it seems unfair to believe that a pastor is in it just for the money. If they think so, they don’t have their facts straight. Some do, I am sure, but not any that I know of. Maybe that’s why seventy percent of pastors polled feel they “are grossly underpaid” as do their spouses (80%), , however, underpayment of pastors is not a biblical solution for preventing greed. In fact, being underpaid could be a result of church members’ greed because they give little or nothing to the church. Money is controlled in many churches today, and giving is down, so the people with the most money have the most influence. Perhaps this is one of the reasons that pastors are underpaid. The same can be said about teachers, so teachers and pastors are among the two lowest paid professionals with degrees. Sadly, this shows just how little society values them, even though the Bible teaches that “You shall not muzzle an ox when it treads out the grain,” and, “The laborer deserves his wages” (1st Tim 5:18). Shockingly, half of pastors’ marriages will end in divorce, while 40 percent of marriages will experience an affair during ministry years, and over 75 percent of pastors say their marriages are in trouble right now . It’s even worse for bi-vocational pastors as they’re already spread so thin that it’s easy to neglect their families so it’s no wonder that 80 percent of pastor’s wives wish their husbands had chosen a different profession and 94 percent feel the pressure of ministry life on a regular basis, so pastoral marriages struggle to succeed, but it’s not from lack of knowing how to live with their wife with understanding, but from the enormous pressure added to normal married life. Add to that the pressure of pastoring a church, and then add a lack of time and privacy that pastors and their wives must endure, and you can see that it’s like sitting on a powder keg, playing with matches. Don’t think pastors ever need counseling? Wrong…that’s what my mentor is for. I believe everyone should have a mentor and everyone should be a mentor. My mentor is a retired pastor who had to leave the pulpit for health reasons, but he’s still living, I believe, for my sake. My mentor, now in his upper 70’s, tells me where I’m wrong, what I could do better, and what to avoid in certain situations. I went to seminary, but there are some things that seminaries can’t teach you, and those are the things which come from experience. They don’t cover everything in a textbook. Some things are learned the hard way, but pastors need help too in the form of counseling, mentoring, and even wounding us when we need it. That’s what friends do (Prov 27:6). He loves me enough to tell me the truth and rebuke me when I need it, but also encourage me when it’s needed too…and that’s very often. One of our church members once asked me, “What do you do all week?” I laid down a bit of my schedule for him because he might have felt I only work on Sundays, but a pastor is on call 24/7 and rarely do they get a full day off, or for that matter, get to use their entire vacation (if the church pays them for it), if they get a vacation at all, so there are many myths about pastors today and after exploding some of these myths, I hope you can see why you need to value your pastor, encourage him, support him, and pray for him. He’s got enough pressure on him already. That same man told me that it’s the pastor’s job to save the lost and grow the church, but in reality, that is God’s job, and the whole church is supposed to be involved. Jesus is the Head of the Church, not me. God alone saves (Eph 2:8-9), even though He chooses to use people as a means to do so, but it is more than just the pastor’s job…it is everyone’s responsibility. Resource – Scripture quotations are from The Holy Bible, English Standard Version® (ESV®), Crossway Bibles. (2007). ESV: Study Bible : English standard version. Wheaton, Ill: Crossway Bibles. Used by permission. All rights reserved. Francis Schaeffer. Statistics on Pastors. Schaeffer Institute. http://70030.netministry.com/apps/articles/default.asp?articleid=36562&columnid=3958 (Accessed Oct. 18th, 2017). Tony Cooke. Statistics and Trends for Pastors. Tony Cooke Ministries. http://www.tonycooke.org/free_resources/messages/stats_trends.html (Accessed Oct 18th, 2017). Kristi Gaultiere. Unfair Expectations on the Pastor’s Wife. Soul Shepherding. http://www.soulshepherding.org/2010/09/the-pastors-wife/ (Accessed Oct 18th, 2017). So many people are always looking for free advice where ever they can find it. Talking to your pastor is no different, it’s like asking for free advise, saying “thank you” and still being thankless. Church Boards can be knowingly or unknowlingly unscripturally brutal on them as well. The words, “double honor” in the Greek means “double the value set by price” That would be a doubled salary for pastors who are also good teachers! Not the pennies from the tip jar. We ought to give money directly to those pastors who provide the most to us. Take them out to eat. Make donations directly to them. Go help them with their needs at home. Give them what they deserve. Don’t be a part of the “Me Problem” within Christianity. It is a cause for great shame. Thank you Mr. Bingham. Spoken like a man with experience and biblical knowledge.